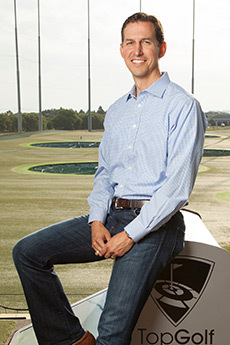 As Chief Financial Officer, William Davenport leads operational finance and strategic planning for Topgolf worldwide, setting the stage for the company’s continued growth, innovation and industry leadership. William previously spent 13 years with Brinker International, where he served as Senior Vice President of Finance for Chili’s and On the Border. During his time with Brinker, William spearheaded the rollout of the catering business for Maggiano’s and evaluated new restaurant brands for acquisition into the Brinker portfolio. He has also held the roles of Vice President of Finance for Neiman Marcus and Last Call and CFO for Haggar Clothing Company. William is a graduate of Texas A&M University. He resides in Dallas with his wife, three children, and pet Corgi named Clyde. William is passionate about soccer, running and cheering on his kids at their sporting events. He is also a self-proclaimed expert on checkout-line bagging – he spent three of his teenage years sacking groceries at Tom Thumb.